Welcome to the online community of Marist Sisters’ College, Woolwich. The College proudly bears the history and charism of the Society of Mary which commenced its work in Lyon, France in 1816. By 1824, the Marist Sisters had begun their apostolic work across Europe led by their Foundress, Jeanne-Marie Chavoin. At the core of College life and learning are the values of our Catholic faith. These are nurtured by the Marist tradition and captured in our College motto: The College was established in 1909 by a group of French, English and Irish Marist sisters, who settled in Woolwich to bring Marist education to the young women of Sydney. Today the College is a thriving educational and faith community beautifully situated in leafy grounds overlooking the Lane Cove River just a few kilometres from the heart of Sydney. “Virtus Super Omnia” (Goodness Above All). These values are brought alive through the symbolism of the “Marist Compass” where students are assisted to develop their own. By living our Marist motto in both word and action, we are called to “think, judge, feel and act as Mary”. Through meaningful experiences which explore every sector of the compass, Marist girls are empowered, act courageously, build relationships as ‘sisters’, and use their gifts to live Life. The contemporary learning facilities assist our young women to engage in the arts, literature, science, humanities, technology, STEM and sport within a vibrant environment. Effective teaching and wellbeing programmes prepare and equip students to meet the challenges of further study, professional workplaces and global responsibility. The benefits of an all-girls school are evident in the fact that girls are always at centre stage. Of necessity they participate, take charge and get involved. The College leaders, captains, scholars, editors, musicians, artists, performers, inventors – they are all girls – professional women of the future. Girls need to be independent at an all-girls school. They are developed to be critical thinkers, self-starters, able learners and contributing team players. We are a “community on the move” preparing for the greater good. Marist Sisters’ College is not just a school with girls, it is a school for girls. It is a special place for girls to learn, explore, discover and grow, supported by a vertical house system that provides guidance and mentoring as well as opportunities for student leadership. This environment, inspired by the Marist spirit, fosters a strong family atmosphere, which cares for each student’s individual needs. 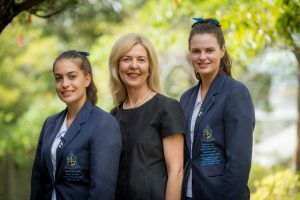 It is my hope that every student who walks through the gates of Marist Sisters’ College Woolwich feels valued and respected, and through participation, develops a strong sense of belonging to the College community.